Transform your corporate culture with Directive Communication Psychology and have fun in the process. The Simplest, Most Powerful book on Leading Corporate Culture Change you will ever find! Successful Change Leadership affects the psychology of a group to improve cooperation and performance. A leader nurtures a superior Organizational Culture by understanding the systematic process of this psychology and how it’s affecting Leaders, Peers and Subordinates to act and react to each other. Your current corporate culture is being affected and reinforced by these simple psychological factors, that once understood, can change employee passion and dedication forever! 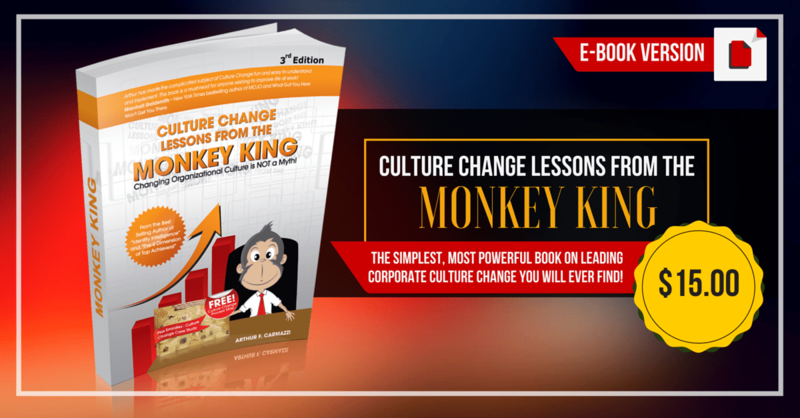 “Lessons from the Monkey King – Leading Change to Create GORILLA-SIZED RESULTS”, makes this EASY to understand and deals with the very real dynamics of how an organizational culture affects an individual and their personal effectiveness. The Simplest, Most Powerful book on Leading Corporate Culture Change you will ever find!